I was in NYC for work during Halloween, so Aaron had to hand out candy to the trick or treaters by himself. He decorated just like I would and added music, a black light and a smoke machine. This is a picture of the front door he sent to my phone. 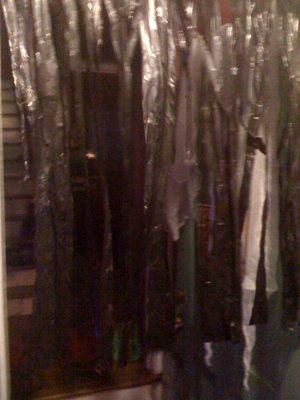 He hung shredded garbage bags for effect. He did a good job, because he counted 306 trick or treaters this year!!! Halloween in NYC was interesting. 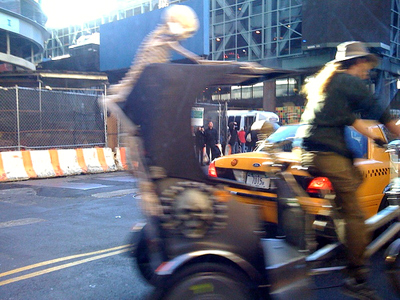 You get used to seeing ghouls riding on scooters and hanging out of taxis. The day after is interesting too as you find abandoned costumes here and there. 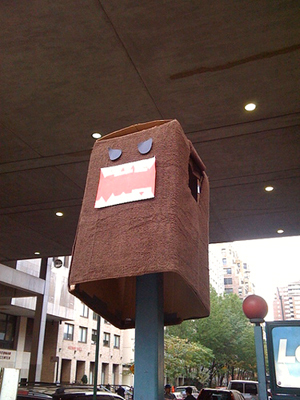 This Domo outfit was left on a post. He looks like an evil Domo.